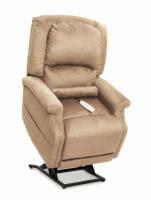 Pride's GL-358L lift chair is an impressive chair designed for someone over 6' tall. The GL-358L is an absolute necessity for tall people needing assistance getting in and out of chairs. Several exciting features you'll find in the GL-358L include blown fiber button back cushioning, an optional heat and massage feature, and an integrated battery backup on the lifting mechanism in case of a power outage. The GL-358L features a patented quiet and smooth operation with stylish designs to add to any home decor. Netters from Godfrey, IL would not recommend this to a friend. I chose Pride due to their excellent reputation. I had to place my order on-line via All Lift Chairs. The chair is excellent and I was initially very satisfied with it. My rep, Eric, was a terrible rep of this company. I was told it was in stock and would have in approx. 10 days - it took over 1 month. One week after I received the massage unit went out, and has yet NOT been repaired. Eric has NEVER been helpful, courteous or professional during this sale. I have a call into service now as the massage unit stopped working one week after I received it. It has not yet been repaired. Delivery was very bad as it set in a warehouse over the weekend, and then the delivery person was unable to get the box into my home, so he left it outside overnight until I could get it inside!! I purchased this chair w/o any help from the rep who never followed up with any of the problems. This was the most frustrating and dissatisfying purchase I have ever made. grandpa from Catskill NY would recommend this to a friend. Poppa from New York State would not recommend this to a friend. Nice color, power backup is OK. Does not feel sturdy enough when getting out of chair. Arms seem to be weak and bend outward. Seems to have a power struggle when lifting, or reclining. Upholstery is a nice color. Fabric is of fair quality, however padding is very poor. Service was excellent, no problems. If this the true quality of your product, I definitely would NOT recommend it to anyone. Would I buy it again? NO, price is too high for quality received. Is it that I just received a defective piece of equipment? I LOVE my chair. It is so comfortable even to sleep in, as I often do..The fabric is o soft you don't need any padding for comfort. 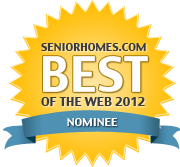 Ma, from Cleveland Hts Ohio would recommend this to a friend. Happy girl from Delaware would recommend this to a friend. GL-358L The Perfect chair for me. Sparks from Chicago, Illinois would recommend this to a friend. 50 year-old construction worker with bad back. This chair is a perfect height for my legs. It is firm so that I do not sink into it. (soft chairs tent to separate my back more and give me more back pain.) Not having to wrestle with the leg lift on the chair is a great feature. All in all, I wish I would have purchased this chair years ago so that I may have had many more comfortable nights in past years. The material used could be a bit smoother, so that you can slide into the chair easier. The heat and massage are ineffective for this chair. I am very happy with my chair. I intend to purchase a second chair in the near future to match some new sofas that I am going to get next spring. Barb from Alabama would recommend this to a friend. Great chair. Better than expected for the cost. Fabric quality is great. Easy set up and easy to use. Just what we needed. Tre from Greenville, SC would not recommend this to a friend. Wheat is good neutral color. Seat is hard and feet hang off. Seems small to me. So if you are 6'1" and weigh about 250 might want to try something else or another brand. I have MS and happen to be 6'1" The chair is advertised to be large and designed for someone over 6'. My ankles hang off the footrest and when I asked for the extension it can only be purchased new and I was told by rep that to return the chair would cost as much as the chair. Also, the seat is very hard and was told it needs a break in time and to buy a memory foam to soften it. I am sedentary with MS so I cannot walk but it would be helpful if they would tell you before you buy that the feet will hang off when seated and that the seating is hard. Sorry to hear about your discomfort with our chairs. 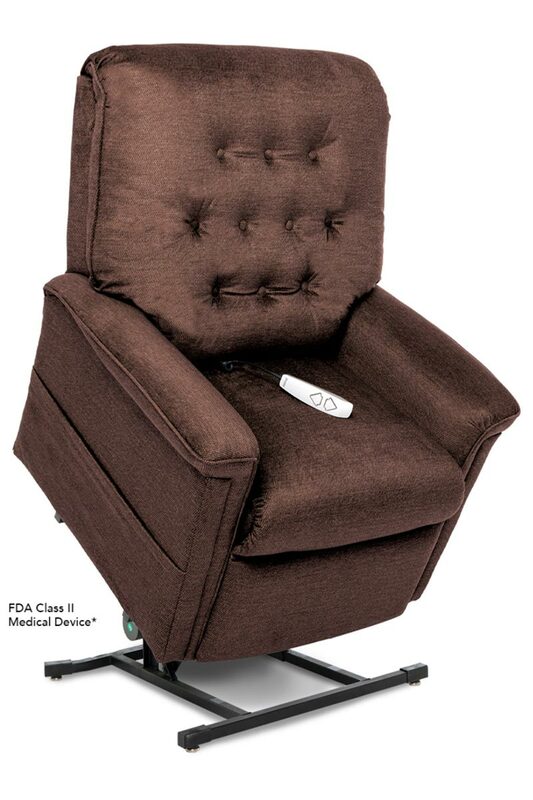 All of our lift chairs are designed for your feet to hang over the end. If your heels were on the ottoman it would put huge pressure on your leg muscles and be very uncomfortable in a short period of time. Not having your heels on the ottoman puts your leg weight on the back of your calves, you can sit for hours without any discomfort. BD from Mount Airy, Maryland would recommend this to a friend. Besides the electronics not working initially, (Pride came out to repair it a week later), the chair worked fine. The lift chair works, but does not work for my disability. The arms are too low whereas the seat depth was a problem. Transferring independently to the chair from a wheelchair was difficult. The chair met the leg extension that I needed, but the arms were too low for transferring. It was my error in not physically trying a Pride lift chair before purchasing one on line. Delivery and install was well done. Service for the electrical problem was fixed within a week. I am unable to use the chair. Can the chair be returned for a refund? Partial refund? How would we be able to do this, if possible? Thank you for your review. Unfortunately, since we ask for reviews 30-40 days after purchase (in order to give customers time to use the product), your purchase cannot be returned. Complete details of our return policy can be found on this page. Joe the bartender from Rancho Santa Margarita, CA would recommend this to a friend. I enjoy the chair very much and it has made getting in and out of a chair so much easier. 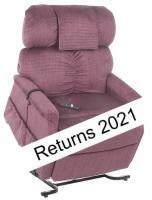 Needed help from Medicare when I was buying this chair. The liftchair was originally sent to the wrong city, which caused it to be delayed getting to my home. Good price. Fabric was as ordered. Very comfortable. Great to have covers for the arms and back.